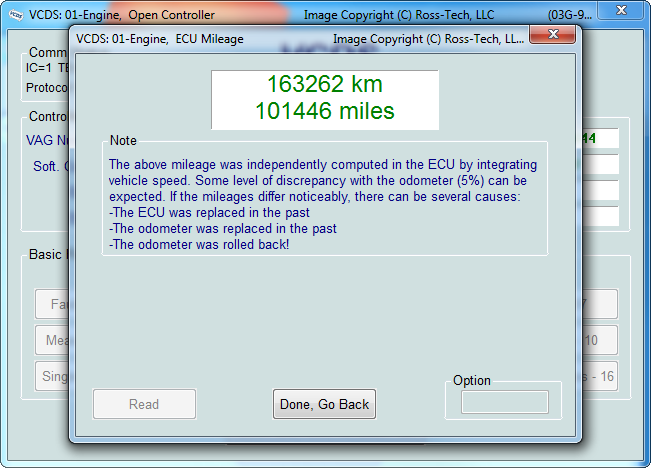 The [EDC15-16 Mileage] function found in the Applications Screen is used to show an independent "odometer" reading stored in the ECU. EDC-15 is found in older TDI engines like the North American market VE 1.9L Golf/Jetta/etc. EDC-16 is used in 2.0L TDI's including all North American PD engines, but not in the newest CR engines. This function also works with some EDC-15 V6 TDI ECUs. This function can be useful as a means of cross-checking the mileage on a used car before making a purchase, particularly in Europe where odometer fraud is rampant. The Option field is only to be used if you are given specific instructions from Ross-Tech.